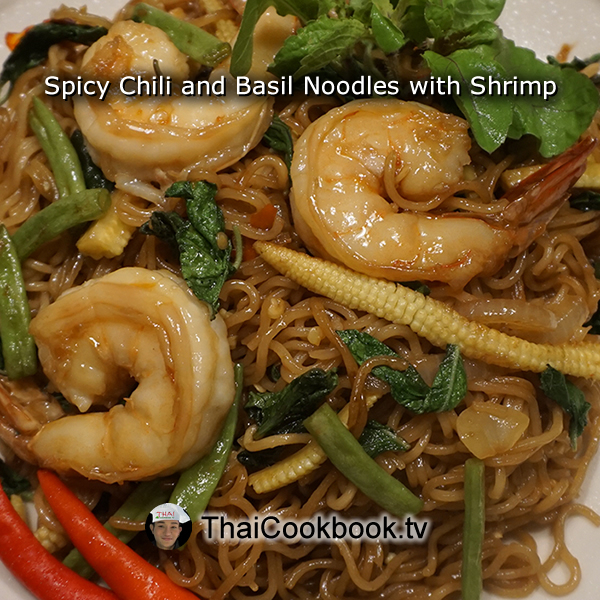 This spicy stir-fried ramen noodle dish is perfect as a one-dish lunch or as part of a traditional Thai family meal. We use ordinary ramen noodle soup squares, pan frying them in a delicious garlic and chili sauce, and topping them with a healthy bunch of our Bai Kraprow basil. Here we used some large fresh prawns, but Pad Kraprow Mama can be made with ground pork, sliced chicken or pork, or even canned mackerel. As you'll see, this dish is quite easy to make up at home with just a few ingredients, and the flavor is amazing. 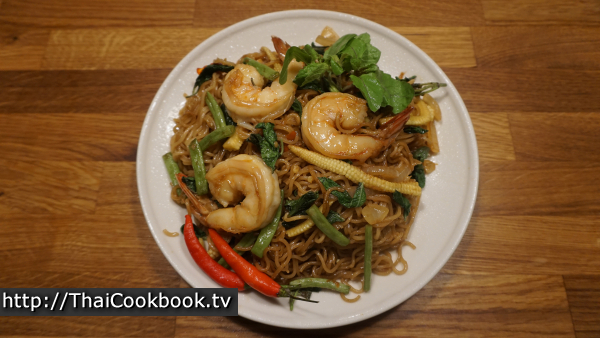 What's in our Spicy Fried Noodles with Shrimp. 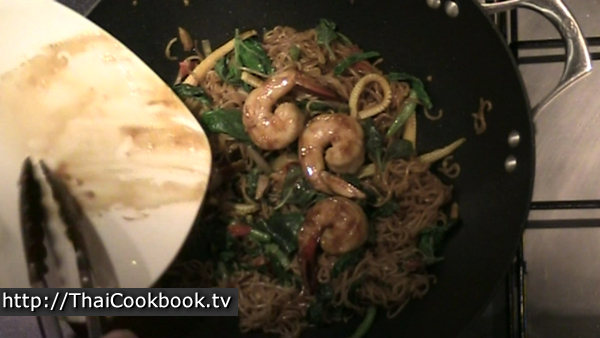 How we make our Spicy Fried Noodles with Shrimp. 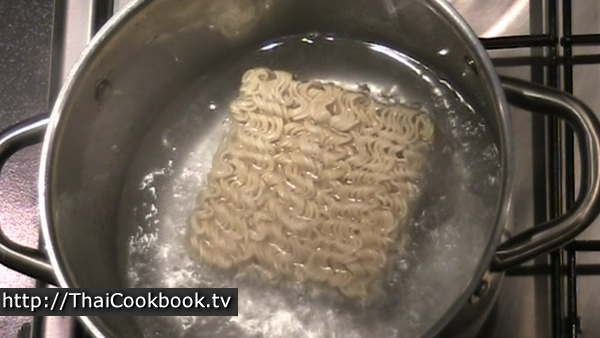 1) Boil the ramen noodles for about one minute or until loosened, then rinse in cold water and drain well. 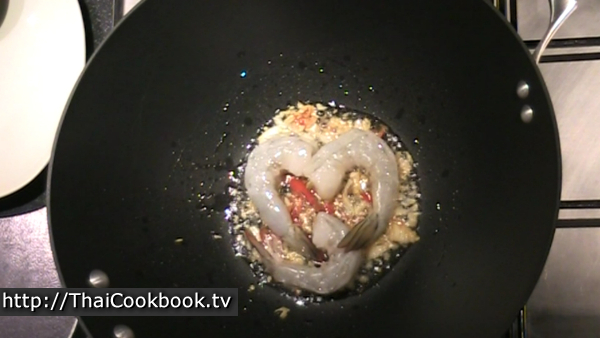 2) Fry garlic and chili in oil until fragrant, then add the shrimp and fry lightly on both sides. Add the sauces and sugar, and fry until the shrimp curl and turn pink, then remove them to a plate. 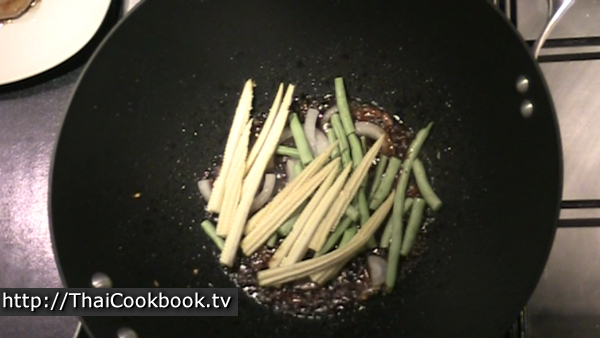 3) Add the onion, corn, and green beans. 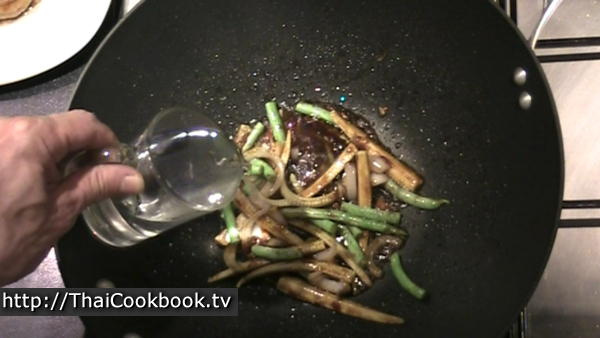 Stir fry for one minute, then add a little water. 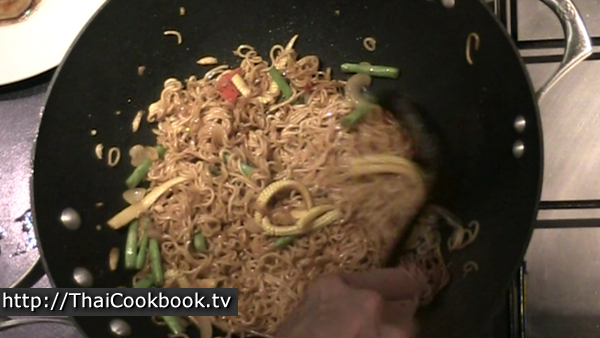 Let it get hot and bubbly, then add the cooked noodles. Turn the heat up to high and fry, stirring and flipping until dry and sticky. 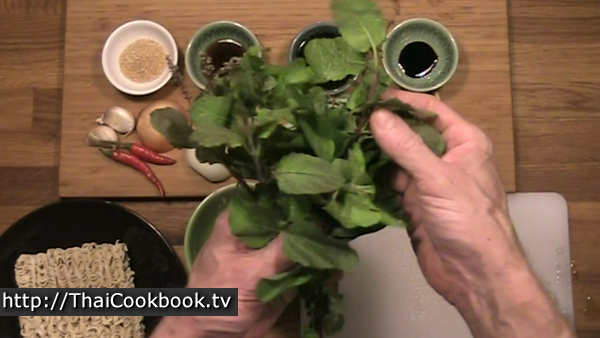 4) Turn off the heat, add the basil and stir it in well. Add the shrimp back in and let them warm up a little, then serve on a large plate. Garnish with fresh basil tops and whole Thai hot chilies. Prepare the shrimp by shelling and cleaning them well. In Thailand you will often get them with the heads on, but here I have removed them. Any size is fine and you can add more shrimp if using smaller ones. 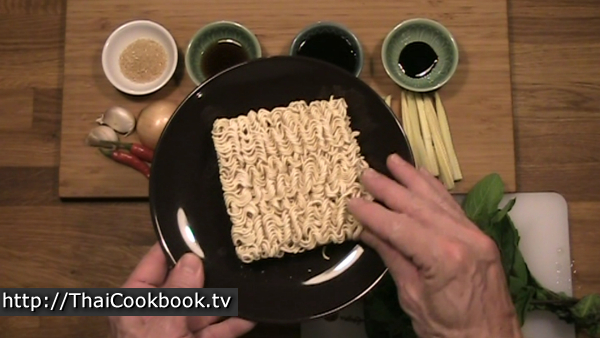 Depending on what size you have, you'll need 1 or 2 ordinary ramen noodle squares. The plain ones are better for a more authentic flavor. Discard the seasoning pack for making soup, or save it to season something else another time. 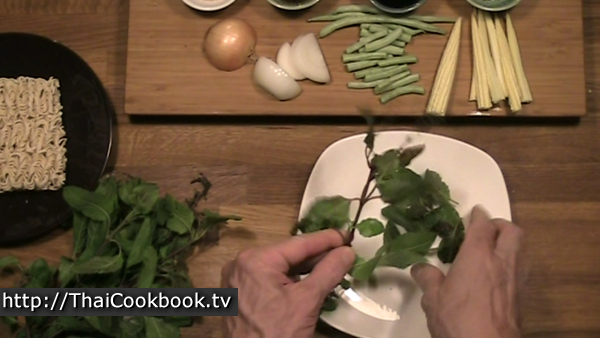 It's important to use the right basil when you make a Thai chili and basil stir fry. 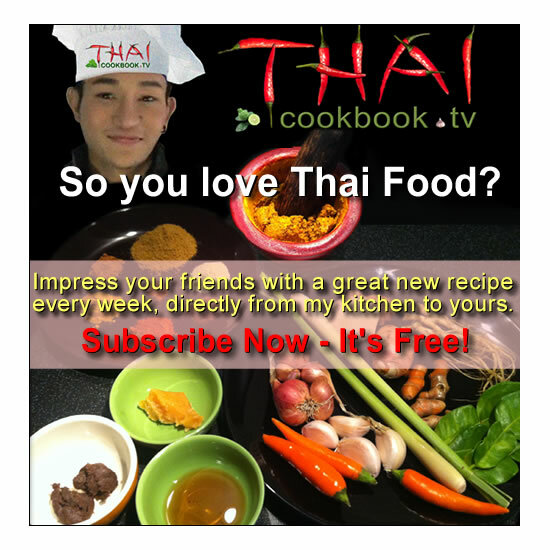 Our name for the dish is Pad Kraprow, and we use our basil called Bai Kraprow. Bai Kraprow has a strong scent of cloves, pepper, and spices, and is the delicious flavor of this herb that we expect to find in this dish. In other places this basil is often called Holy Basil, and it is quite different from ordinary Thai Sweet Basil that is used in soups and curry dishes. I usually use between 2 - 4 Thai hot chilies with a couple of large garlic cloves, but you can adjust the amount of chili to your own tastes. 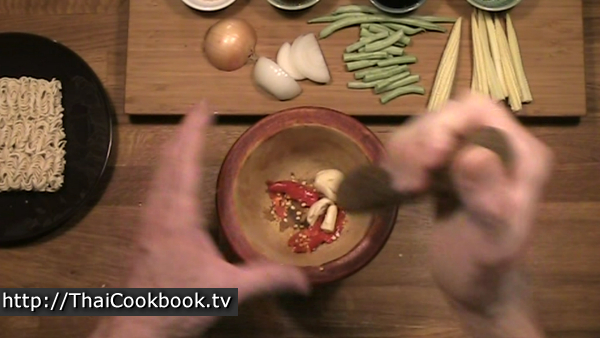 If you leave the chili out it will still be delicious, but in Thailand this dish is usually made very spicy. Grind the chili and garlic together until roughly chopped. Pluck the leaves and flower tops from the basil until you have at least a cup or more. 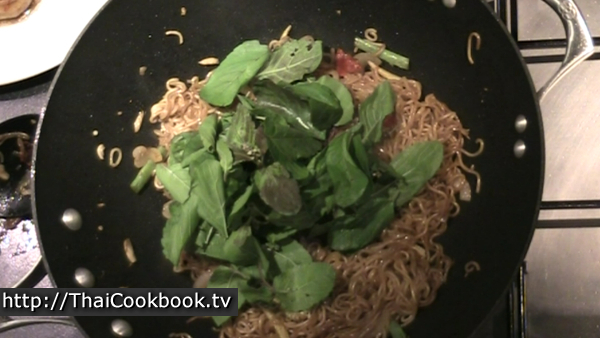 The more basil you add, the more flavorful your noodles will be. Split the baby corn ears into long, thin strips. 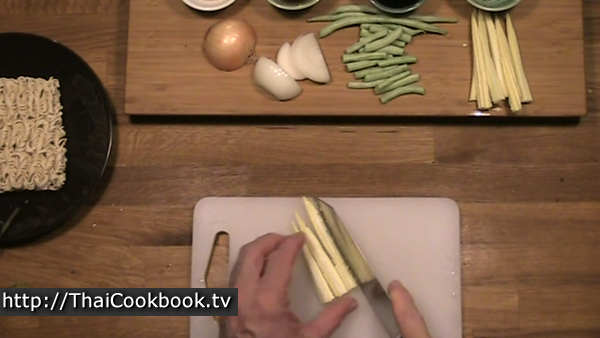 Cut the green beans into 2 inch pieces, and the onion into thick slices. Boil a big pot of water so the noodles float and cook freely. As soon as they loosen up and cook a little, about a minute, drain the water and replace it with cool water to stop them from cooking. 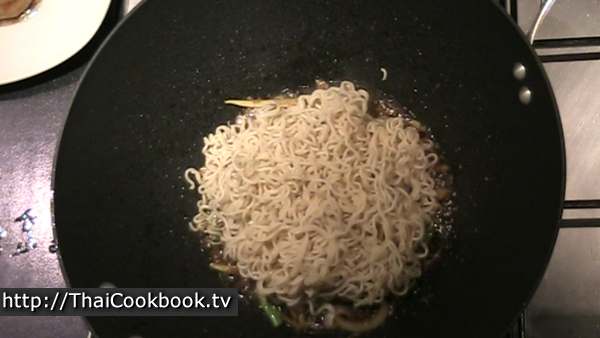 The noodles should be a little firm so they don't fall apart when you fry them. Drain the water away and let them dry well. 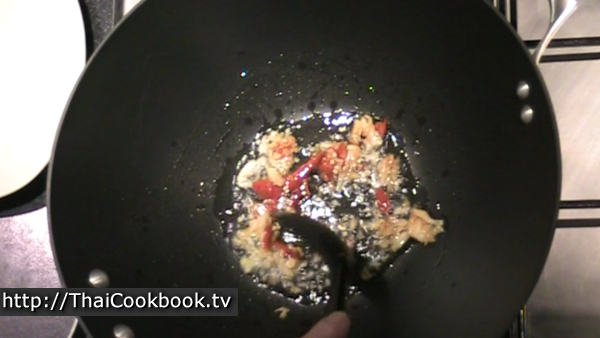 Heat the oil in a wok or large pan over low flame. Fry the garlic and chili lightly until fragrant, for about 30 seconds. Lay the shrimp in the chili and garlic and fry them lightly on both sides. 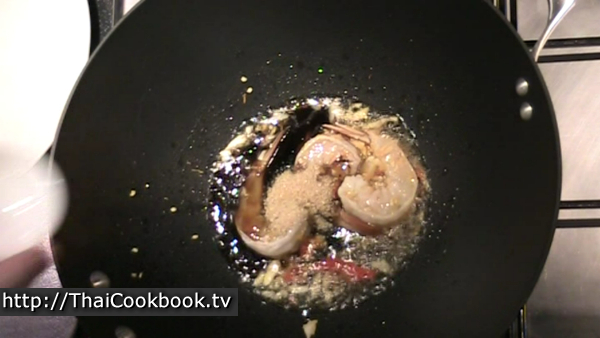 When the shrimp start to curl up a little, add the sauces and sugar and stir it up well. As soon as the shrimp turn pink and curl up completely, they are done. Remove them from the pan to a plate and sit them aside for now. Add the onion, green beans, and corn. Stir them in well until well coated with the sauce. Fry lightly for about a minute or until hot and sticky. 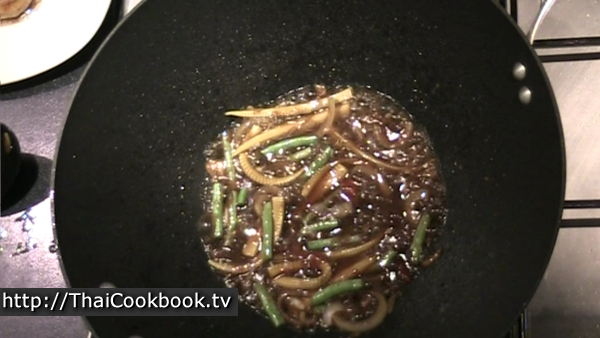 Add about 2 tablespoons of water to deglaze the pan and make a sauce for the noodles. 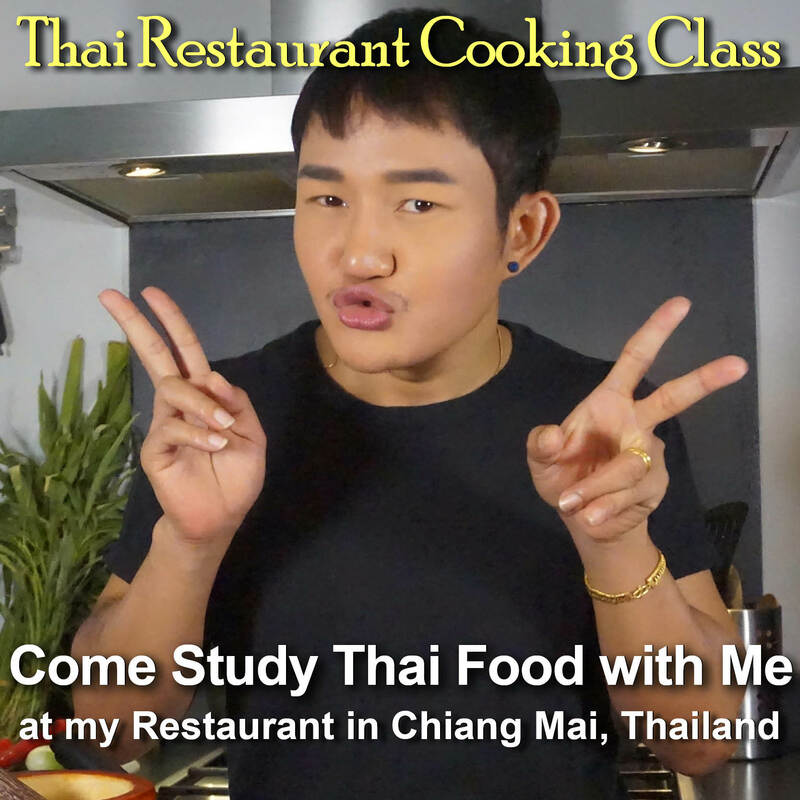 Continue cooking until and bubbly again. Turn the heat up to high, then add the noodles to the pan. Stir and push them into the sauce, flipping from the bottom until they soak up all the liquid. Keep frying, flipping and stirring over high heat until the noodles are dry and sticky, and starting to brown in some places. Turn off the heat, then toss in the basil leaves. Stir and flip from the bottom until the basil is well mixed in and lightly wilted. 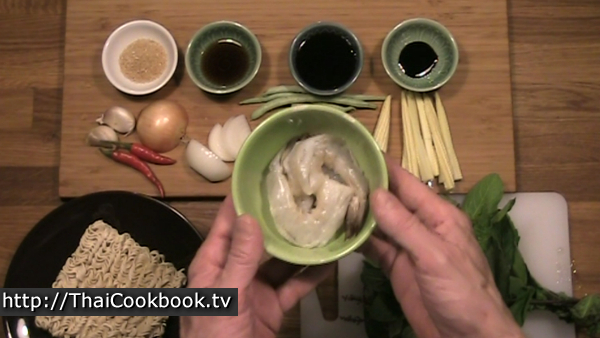 Add the shrimp back in and stir them in the hot noodles until they get warmed up again. Serve the noodles on a large plate as a one-dish meal, or a nice side dish to be shared at the table as part of a complete meal. Arrange the shrimp, basil pieces, and vegetables evenly so it all looks great, then garnish with a few fresh basil tops and a couple of Thai hot chilies.